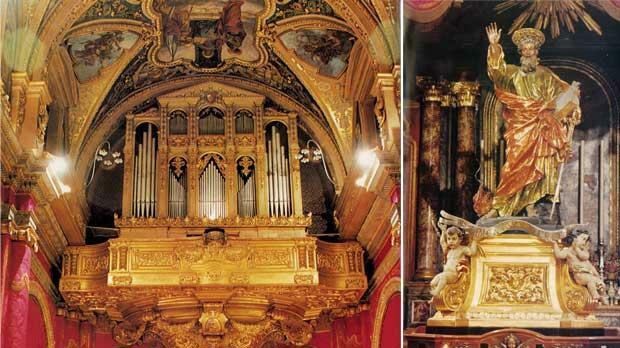 The organ loft of St Paul Shipwrecked collegiate church in Valletta. Right: Melchiorre Gafà’s statue of St Paul, which is carried in procession through the streets of Valletta on his feast day. 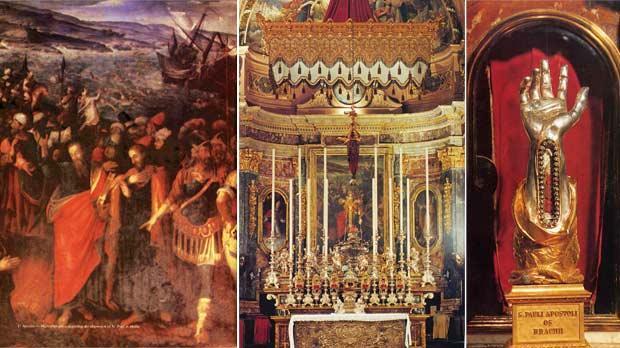 From left to right: The titular altar-piece by Matteo Perez d’Aleccio showing St Paul’s shipwreck on Malta. The main altar of St Paul’s collegiate church decorated on the feast day (February 10), with the set of gold and silver statues of the Apostles. The reliquary containing the wrist-bone of St Paul, originally donated by Pope Pius VII to the Bishop of Malta in 1818. In his account in the Acts of the Apostles of St Paul’s shipwreck on the island of Melite (Malta) in 60 AD, St Luke describes the islanders’ first meeting with the apostle, and speaks highly of their warm hospitality. Our forefathers quickly embraced the Christian faith, strengthened by the miracles St Paul performed, and which were recorded by St Luke, who was accompanying him on his way to Rome to be tried. The evangelist’s narration of St Paul’s departure from the island and the kindness shown to him and his companions by the Maltese throughout their three-month stay are testimony of the first Christian community on the island. This opinion was shared by St John Chrysostom (c. 359-407), who in his commentary on the shipwreck says the attitude of the islanders as the apostle left for Rome proves that many of them had by then accepted the Gospel of Christ. The church of St Paul in Valletta is the only one in Malta dedicated to the apostle’s shipwreck on the island. The Maltese historiographer Gio Francesco Abela describes the church in his Descrittione di Malta (1647) as “a most beautiful temple”. It was the bishop’s church in Valletta, as the Conventual church of St John then belonged to the Knights of St John. The parish church of St Paul was elevated to a collegiate church in 1733. Since Valletta was a commercial hub, several confraternities or trade guilds were instituted in this church. They included guilds of shopkeepers, meatsellers, fishmongers and greengrocers. On the feast day of their patron saints, St Crispin and St Crispinian, the members of the guild of cobblers and harness-makers used to donate a pair of shoes to their spiritual director, the merchants, tavern-keepers and cooks gave their rector a barrel of wine, while the drapers, tailors and weavers presented their spiritual director with a cassock. Among the many benefactors of this church was the island’s British Governor Sir Richard More O’Ferrall (1847-51), an Irish Catholic, who donated a silver mace and whose oil portrait by Giuseppe Calleja hangs in the vestry. The main altarpiece, depicting the shipwreck of St Paul, is by the artist Matteo Perez d’Aleccio (1547-1616), a follower of Michelangelo, and who is famous for his scenes depicting the Great Siege of Malta in the Grand Masters’ Palace in Valletta. The painting was commissioned by the Bishop of Malta, Tommaso Gargallo (1578-1614). The architect Lorenzo Gafà (1630-1710) and his sculptor brother Melchiorre (1635-67), both contributed to St Paul’s church in a major way: Lorenzo designed the elliptical dome, while Melchiorre sculpted the titular wooden statue of St Paul at his bottega in Rome. It shows the apostle in the act of preaching – a prototype for all other statues of St Paul in Malta. Other treasures in this church include the relic of part of St Paul’s right wristbone and one of the four marble pillars or legs of the table on which the apostle was beheaded in Rome in 64 AD – the relic as donated to this church by Pope Pius VII in 1818 in recognition of services rendered by the collegiate chapter during the plague outbreak of 1813. The church’s large collection of precious objets d’art include a large silver salver bearing the coat-of-arms of Grand Master Gregorio Carafa, a monstrance set with diamonds and with the coat-of-arms of Grand Master Adrien Wignacourt, and another large silver monstrance donated by Grand Master Emanuel Pinto, who also gave this church a sedan chair, a large silver oil lamp donated by Grand Master Ramon Perellos and another oil lamp with the arms of Grand Master Antonio Manoel de Vilhena. There are also a solid gold jewelled chalice, a gift from Pope Pius X to Bishop Gaetano Pace Forno, who later donated it to his church; a gilt monstrance set with diamonds, which was carried in procession during the International Eucharistic Congress held in Malta in 1913; silver and gold chalices bequeathed by various priests and prelates, and various silver altar-fronts. Special mention should be made of the solid silver altar-front on the high altar representing the scene of St Paul’s shipwreck. A set of six small gold and silver statues of the Apostles displayed on the high altar are identical copies of those at the Lateran Basilica of St John in Rome. St Paul’s collegiate church is a veritable treasure house of artistic works and craftsmanship. The feast of St Paul Shipwrecked, a public holiday in Malta, will be celebrated in Valletta on Friday.